HONG KONG - China is preparing to arm its stealthiest submarines with nuclear missiles that could reach the U.S., cloaking its arsenal with the invisibility needed to retaliate in the event of an enemy strike. Fifty years after China carried out its first nuclear test, patrols by the almost impossible-to-detect JIN class submarines armed with nuclear JL-2 ballistic missiles will give President Xi Jinping greater agility to respond to an attack. The nuclear-powered subs will probably conduct initial patrols with the missiles by the end of this year, “giving China its first credible sea-based nuclear deterrent,” according to an annual report to Congress submitted in November by the U.S.-China Economic and Security Review Commission. Deploying the vessels will burnish China’s prestige as Xi seeks to end what he calls the “Cold War” mentality that resulted in U.S. dominance of Asia-Pacific security. Since coming to power, Xi has increased military spending with a focus on longer-range capacity, including plans to add to the country’s tally of a single aircraft carrier. China’s nuclear-defense strategy is engineered to provide retaliation capability in the event of attack from nuclear-armed nations as far away as the U.S. and also from Russia and India, according to Felix Chang, a senior fellow at the Foreign Policy Research Institute in Philadelphia. While China doesn’t view North Korea as a direct nuclear risk, officials are concerned about what might happen if North Korea threatened South Korea or Japan and the region became unstable, Chang said. China’s nuclear-armed submarines will be “useful as a hedge to any potential nuclear threats, including those from North Korea, even if they are relatively small,” he said. The deployment of the submarines could pressure China to assure foreign militaries that its navy chiefs and political leaders can communicate with and control them. Chinese and U.S. ships and planes are coming into greater proximity in the Pacific as China asserts its claims to territory in the South China Sea and East China Sea, risking near misses or a clash. Former U.S. Defense Secretary Robert Gates said in an interview last January that ex-President Hu Jintao “did not have strong control” of the People’s Liberation Army. The “best example,” Gates said, was China’s roll out of its J-20 stealth fighter jet during a visit he made in January 2010. The event seemed to catch Hu unaware, Gates said. Since coming to power, Xi has tightened his grip on the military, taking over as head of the Central Military Commission in November 2012, when he became Communist Party chief. Hu waited about two years before becoming chairman of the commission. “China is going to have to reassure their adversaries that those submarines are under positive control at all times,” said Malcolm Davis, an assistant professor of China-Western relations at Bond University on Australia’s Gold Coast. “Positive control” refers to the procedures to ensure the CMC’s absolute control of its nuclear assets, such as the authorization codes it would send to submarines, where, after verification by the commander and probably two other officers, missiles would be launched. “It demands that China set up appropriate command and control infrastructure to ensure that the CMC can keep in touch with the submarines, even when they are at sea and under the water,” Davis said. “The U.S., U.K., France and Russia all maintain such communications capabilities for ensuring positive control” of their submarines at sea. By assuring potential enemies that weapons will only be fired if ordered by central command, China’s military would increase the deterrent value of its nuclear-armed submarines, he said. “Those assurances are likely to be made at the highest level military-to-military meetings behind closed doors,” Davis said. 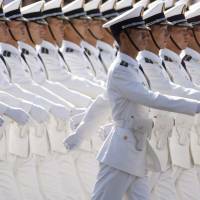 Otherwise China is largely expected to keep its nuclear capabilities secret. “High-confidence assessments of the numbers of Chinese nuclear capable ballistic missiles and nuclear warheads are not possible due to China’s lack of transparency about its nuclear program,” the U.S. report to Congress said. The Pentagon hasn’t provided an estimate of the size of China’s nuclear warhead stockpile since 2006, according to the report. China’s Defense Ministry did not reply to faxed questions about when regular patrols by nuclear-armed JIN-class submarines would begin, or China’s nuclear strategy. The modernization of China’s nuclear forces is focused on improving the capacity to deter other nuclear powers, Giacometti said by phone from Brussels. Until 2006, its only ballistic missile able to deliver a nuclear warhead to the continental U.S. was the liquid-fueled, silo-based DF-5A, he said. These were considered vulnerable because fueling takes a few hours during which the missile must remain in its silo. To protect them, China built mock silos and adopted a policy of secrecy that made a disarming first strike harder to execute. In 2006, China introduced the land-based mobile DF-31A ballistic missiles, whose 6,959-mile (11,200-km) maximum range could reach the U.S. The missiles are solid-fueled, so can be fired almost immediately if warheads are pre-fitted, Giacometti said. The U.S. intelligence, surveillance and reconnaissance capabilities — from satellites to high-altitude drones, such as the Northrop Grumman RQ-4 Global Hawk — can monitor vast areas of territory and detect mobile intercontinental ballistic missile launchers, he said. Any information gleaned could be transmitted to U.S. strike assets, from long-range high-speed missiles to B-2 Spirit Stealth Bombers, to take out the launchers before they fire. In comparison to the land-based launchers, nuclear-powered ballistic-missile submarines that rarely need to surface are much better at hiding. Right now, China has three of those — the JIN class — and is likely to add two more by 2020, according to the commission’s report. Each could carry 12 JL-2 missiles, which after a decade of development “appear to have reached initial operational capability,” it said. The JL-2’s range of about 4,598 miles means China could conduct nuclear strikes against Alaska if it unleashed the missiles from waters near China; against Alaska and Hawaii if launched from waters south of Japan; against Alaska, Hawaii, and western continental U.S. if fired from waters west of Hawaii; and against all 50 U.S. states if launched from waters east of Hawaii, the report said. “The big scoop would be determining where those submarine patrols will take place,” Chang said. 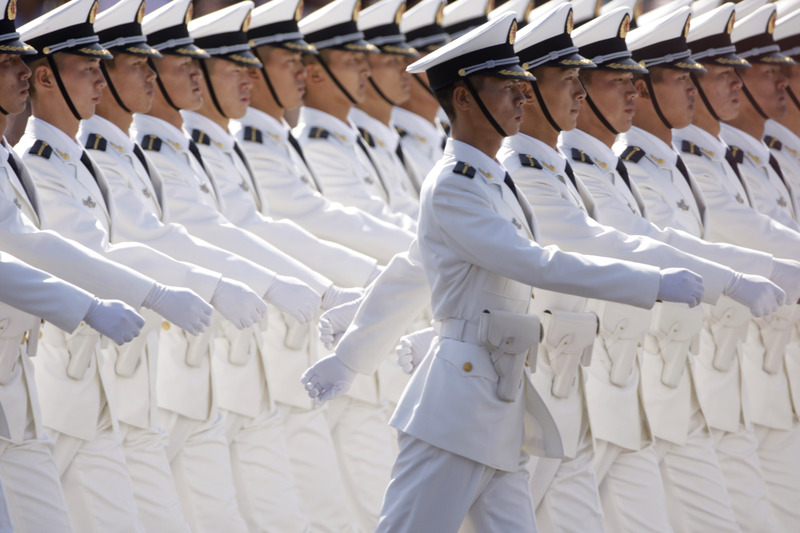 China’s advances are cause for concern in some parts of the U.S. defense establishment. “We must continue to modernize our nuclear capabilities,” Adm. Harry Harris said Dec. 2 at his nomination hearing to become commander of the U.S. Pacific Command, when asked how the U.S. should respond to China’s buildup. Analysts don’t expect China to modify its long-standing “no-first-use” nuclear policy that states its weapons will only be used if China comes under nuclear attack. Having enhanced its nuclear-deterrence capability, China may begin to communicate more about the planned evolution of its nuclear forces, Giacometti said. “More openness on China’s side might then open up more space for confidence-building measures and lay the ground for future arms control discussions,” he said.